Look what came in the mail today from my mom. That's some 7/8" ribbon I designed. Attached to a zipper. And lined with fabric on the back. You start zipping, around and around. And you get a coin purse! These are made following Craft Passion's ingenious tutorial right here. 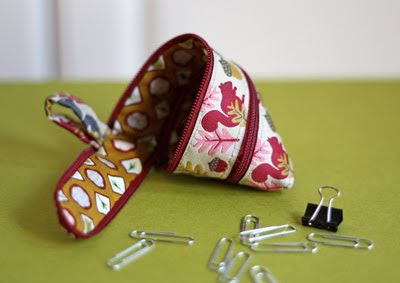 Grandma G's notes: "I followed the directions pretty much to the letter on the sewing-themed pouch, except that I did a traditional backstitch because I wasn't clear on exactly how she did hers. For the squirrel one, I again did the traditional backstitch because it ends up looking like a sewing machine stitch, and then I sewed by machine where I could to save a little time. The pouches don't need to be lined, but I'm glad I did it. 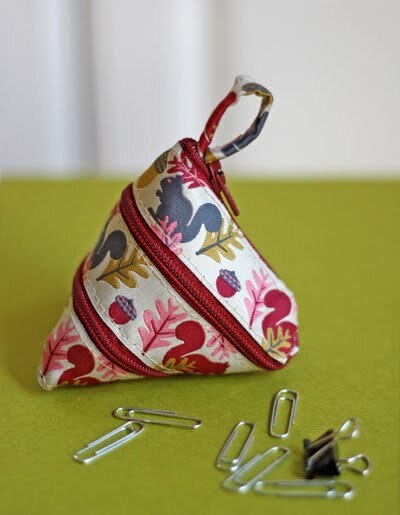 Not only does the lining give a more finished look, but it also adds to the stability of the pouch." Thank you, Mum! I already know what I'm going to use these for. HA! That's awesome :-) What a cool little project. I have no idea how your mum can envision the final 3D piece from the straight piece of ribbon. Adorable! Heather B..... You give me too much credit! I only followed the directions supplied by Craft Passion! :) Check out the tutorial... you can make one, too. Such a clever design, and your print is so dear, and ideal for this. I already feel intimidated by this... *how could something this ingenious be simple enough for me to attempt?! * But I really do want try... uh, where oh where is my zipper foot, my sewing manual, my nerve? freakin awesome!!! it's like a little fortune cookie! Those are so cute!! I especially like the sewing themed one! Thanks, Grandma G and Jessica, for reviewing the tutorial. The ribbon you designed are lovely!!! Sew awesome! It just gave me a bright idea... if we did them in Xmas colours you could hang them on the tree or make a really groovy Christmas countdown thingy! ...wait, I didn't read it all the way thru .. your own ribbon... that is so cool!!!!!!!! Do you have a list stockists of your ribbons & fabric? That is so cute and clever! Consider my mind blown. This is awesome! whaa?!! brilliant i say = brilliant! 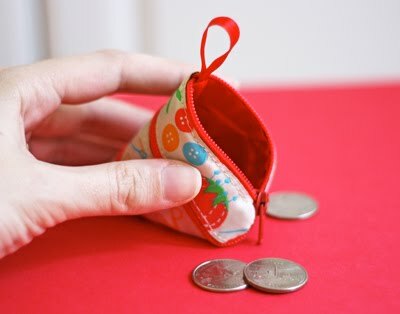 Too cute that this is an awesome little coin purse. This looks awesome! What a great idea. Rad is all I can say. That is really cool. Now I really need to conquer my fear of zippers. FINALLY! A great and unique idea for use with all that cute ribbon out there. THANKS SO MUCH! Rie, I don't have a complete list of stockists since I don't know all the stores that carry my designs. 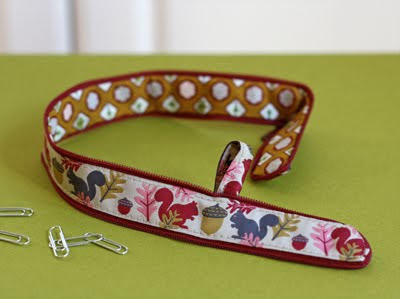 But if you click either the fabric or ribbon links in my top left sidebar, you can find some links for ordering online. Super cute! Your ribbon looks wonderful done up with that red zipper. That is amazing! 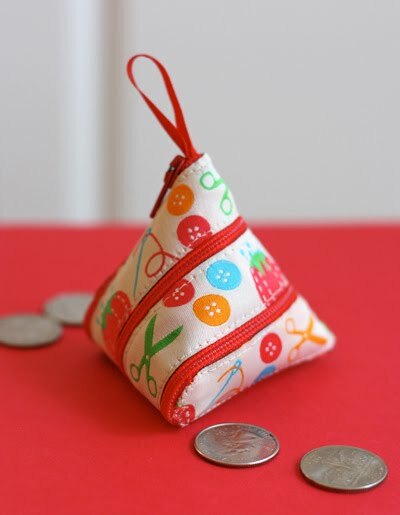 A very different take on a "zipper pouch"! That is so cute, and something I think my son would like to play with even though he shouldn't :) Unless of course we store little toys in there instead of coins! I love that you posted this. It's a great little gift idea. And that ribbon is adorable! That is genius! Love the ribbon pattern! cool! These would be perfect for kids! I saw that great tutorial and haven't had time to try it out yet, those are TOO DARN CUTE! Thanks for sharing! I agree that it's adorable, but WHAT are you going to use it for? I noted that in the post, then when your Mum also alluded to the use, it just upped the ante. What, what, what??? DON'T TELL!!! They might get stolen!!! I'll tell! I used to keep loose change for parking meters in my car's ash tray. Until the entire ash tray was stolen one day when the car was broken into. Now loose change gets tossed into the big compartment between the seats and rolls around in there. My husband uses a ziplock baggie for the change in his car. These little zipper guys are going to hold our quarters. Oh my gosh! That's such a great idea! I'm definitely going to have to try that out!! wow, this is nuts! so creative!! Okay, then.... when they get stolen, I'm not making you more! Love the sewing themed ribbon BTW. Well, I've heard a rumor that she might sew something for a giveaway someday. Uh oh! Now ya done it! Hmmm.... I wonder what they'd like??? Seriously! Amazing! I'm putting aside my quilt and going to pick up supplies for this ASAP. Thank you, thank you! Grandma G and Jessica - very cool, and the purse is pretty snazzy too. If I start now I may be able to make one ready for my mum for christmas..
SWEET! I'm already planning a trip to the fabric store on my way home. Finally a good use for all that adorable ribbon I seem to collect with no purpose in mind!!! That is one of the most awesome things I've ever seen. How clever and cute! You have no idea how long I've been staring at these photos! What a fantastic, creative project - I want to make one, and I don't even sew!!! (Life-long fear of sewing - long boring story). This is incredibly genius. I might have to give it a try! Your mom ROCKS! I love her versions of the purse, especially with your ribbon! I still cannot figure out how it all zips up. My mind cannot figure it out at the moment LOL Guess that's why it isn't seen everywhere! How adorable! Love the ribbon! Quick question for your mom -- the tutorial specs up to 5/8" ribbon, but if I use your Light Blue Funky Flowers 7/8" ribbon, will I need to use a different (maybe longer) zipper? Cate... it works with the 7/8" ribbon just fine as is. You won't need a longer zipper. Have fun! COOL!!! I know tons of girlies who would love this. I'd love to know if Grandma G was able to machine stitch any of the lining itself? Or did you hand stitch that part? Thanks so much! Oh, this is just to cute. Thank you for sharing this great project. The link is in the post, or you can click here. Wow! That is truly amazing. Thanks for sharing this. Waaaah.... Beautiful coin purse. Will be a great gift for my customer. Thanks for the tutorial! I made one, too. I posted it on my blog (for all 3 of my followers, lol!) and linked back to your page. Thanks, again!